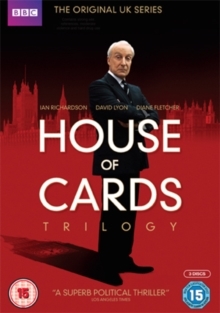 Box set containing the Urquhart trilogy: three series based on the bestselling novels by Michael Dobbs, starring Ian Richardson as corrupt politician Francis Urquhart. In 'House of Cards', Urquhart is a long-serving MP who has his eye on the top job, and will stop at nothing to fulfil his ambition. As the trusted Chief Whip, he has insider knowledge that could bring down the already precarious Prime Minister, and in order to unleash his power he draws innocent young journalist Mattie Storin (Susannah Harker) into his schemes. 'To Play the King' continues to follow Urquhart's career. Having been made Prime Minister at the end of the last series after murdering an investigative reporter, he now crosses swords with the newly crowned monarch (Michael Kitchen) - a passionate man with firm liberal beliefs on the future of the country. In the final part of the trilogy, 'The Final Cut', Urquhart is well on his way to becoming Britain's longest-serving Prime Minister, and is starting to plan his retirement. He still has the Cyprus peace treaty to tie up, however, and the dark secrets from his past are beginning to come back to haunt him.